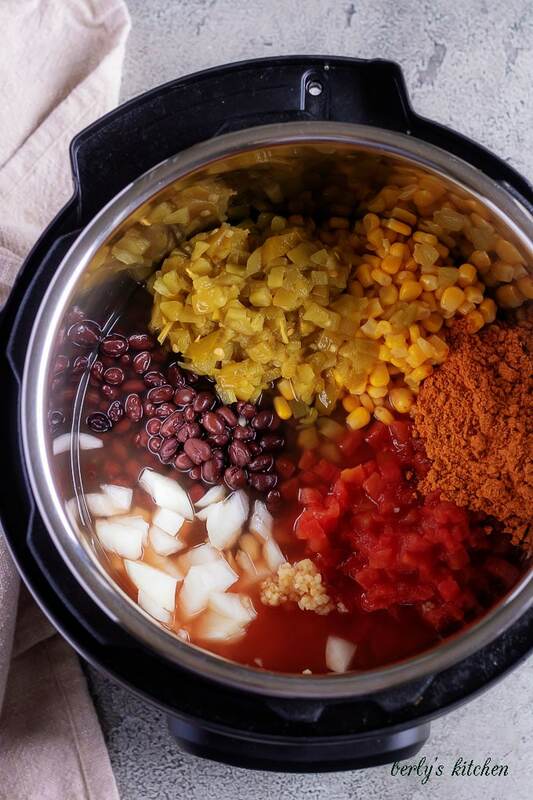 Create a simple and tasty black bean chili in a pressure cooker in less than 20 minutes using your favorite ingredients like black beans and green chiles. 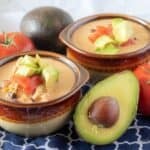 Temperatures are starting to cool off here in the Ozarks, so Kim and I decided to share a bunch of quick and easy Fall recipes. We spent all day, yesterday, putting together five different offerings for our pressure cooker. Why the pressure cooker, you ask? Well, simply put, the last couple of dishes we’ve shared have been time intensive. Kim and I thought we could all use a break. So, for the next few posts, you’ll see some Fall foods that don’t require you to stand in the kitchen all day. Offerings like today’s black bean chili. 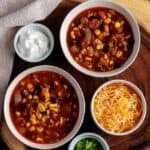 This one is such an easy chili to prepare. If you don’t have an Instant Pot, don’t worry, it can be made on the stove. It should be noted, there is no meat in this black bean chili. While we aren’t a vegetarian blog, I still think we can share a meatless dish that anyone can enjoy. Another quick note to add, our chili is a bit spicy; so, if you don’t like a lot of heat, then feel free to reduce the amount of taco seasoning. As par for the course, I will discuss this and other tips at the end of the post. In the meantime, how about we get down to business? First, go ahead and open all the canned vegetables and chop the onions. Make sure to take a moment and drain and rinse the black beans. I usually just grab a colander, empty the can of beans into the colander and rinse the them with tap water. Don’t worry about drying them off. 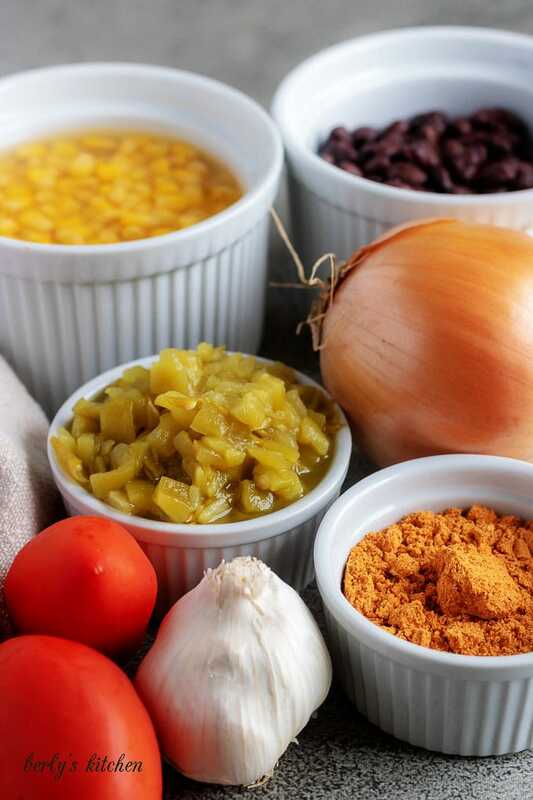 Once you have everything prepped, dump all of the ingredients into your pressure cooker. Remember when I said this black chili was easy? I wasn’t joking, it doesn’t get much easier than this to create a quick and filling dinner. Next, set your Instant Pot or pressure cooker to Manual/High Pressure and let it do all of the work. Coming to pressure should only take about 10-minutes; however, that depends on the make and model, I suppose. Then, once the black bean chili has finished cooking, carefully preform a quick release and let out all the steam. After that, stir the chili and grab your bowls. Last, portion out the chili into 1-cup serving sizes. 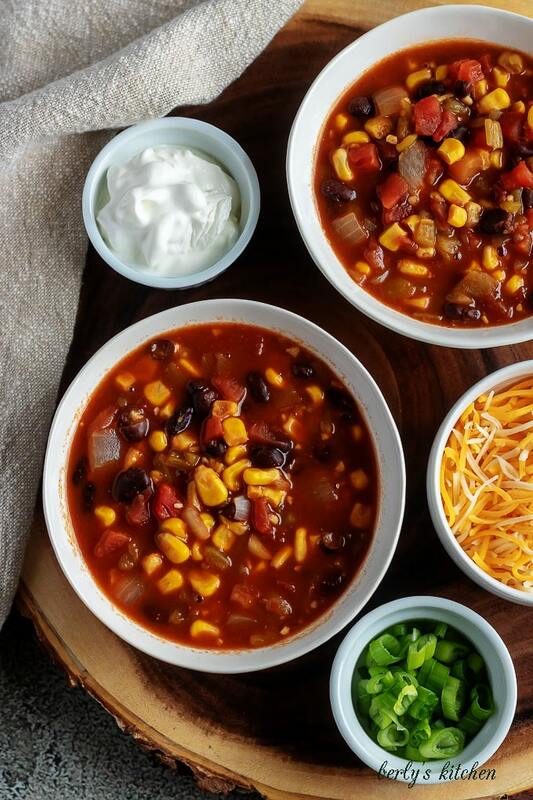 At this point, feel free to grab any toppings you like for your black bean chili. 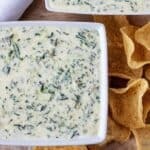 We chose cheddar cheese, diced green onions, and sour cream. That’s it, you’re ready to eat. Kim and I hope you enjoy the dish. If you prefer meat in your chili, then simply brown some ground beef in a skillet first, add it to your cooking pot, then follow the rest of the instructions. On the other hand, you can brown the beef in your pressure cooker; but Kim has heard of a lot people complaining they got a burn notice when they did that step. If you chose to cook the meat in your pressure cooker first, then I would add about 1-tablespoon of vegetable oil per pound of beef. Also, make sure you de-glaze the bottom of the pan using the broth. What’s de-glazing you ask? That happens when you pour a liquid into a hot pan and use a wooden spoon to scrape off all the bits of fat and meat that have stuck to the bottom of the pan or pot. In regards to the heat. 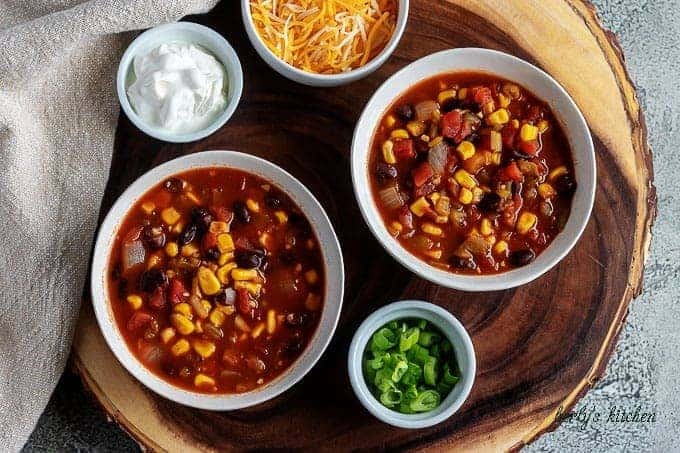 While this black bean chili may not seem spicy to some, it might be overly seasoned to other people. So, if you’re worried about the spice, then only add half of the taco seasoning packet before cooking the chili. When it finishes cooking, taste it and add more spice as needed. You don’t like black beans? That’s okay, swap out the can of black beans for a can of pintos or kidney beans. Also, if you don’t own a pressure cooker, you can still combine all the ingredients into one pan and cook it on the stove. Just remember to drain and rinse the black beans, and increase the cook time to about 30-minutes to boil out the canning taste. Need more Fall recipe ideas? Take a look at our Three Bean Chili or our Easy French Onion Soup! First, in your Instant Pot or pressure cooker, combine all of the ingredients. Next, set the pressure cooker to Manual/High Pressure for 4-minutes. Then, once the timer has gone off, do a quick release and give everything a quick stir. Last, portion out the black bean chili and serve with any condiments you desire. The calories listed are an approximation based on the ingredients and a serving size of about 1-cup. Furthermore, it does not include any toppings such as cheese, onions, or sour cream. 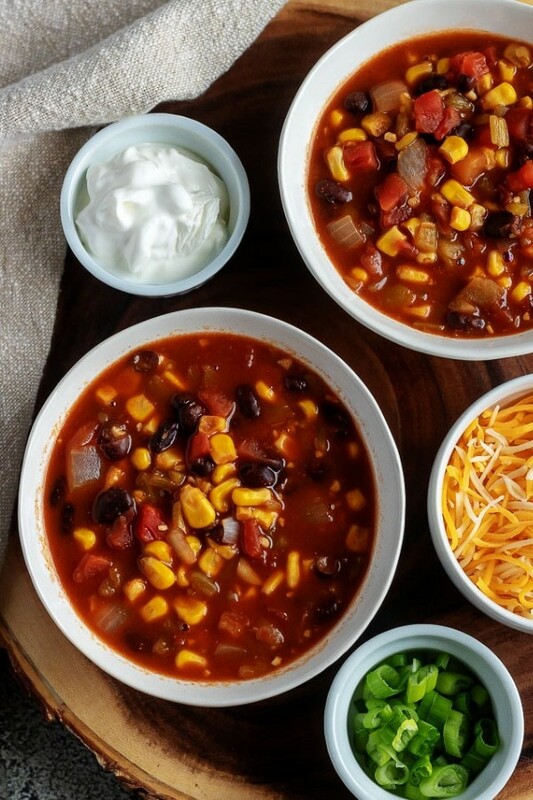 The black bean chili can be stored in your fridge for up to 3-days in a sealed container.